Switzerland, Austria, Slovenia, Croatia, Serbia, Macedonia, Greece, Italy, France, Andora, Spain, Belgium, Netherlands, Germany, Denmark, Sweden, Norway, Finland, Estonia, Latvia, Lithuania, Poland, Czech Republic, Slovakia, Hungary. Passed around 18.000 km for 55 days from which actively cycled were 13.607 km for 50 days. After the successful Tour d’Europe 2004 marathon –– Delco Angelov decided that it is time for a new challenge. Delco’s mission was to accomplish something that nobody has ever done before, to cycle a route around the entire territory of Europe… Shortly, after careful planning with his team members, the exact route of the upcoming marathon was established. It included passing through 25 European countries and cycling total of 14,000 kilometers. It was assumed that if Delco cycled an average of around 280 km per day, the marathon would be finished in only 50 days. 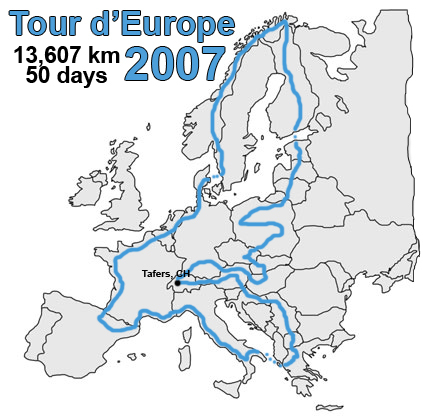 Having such an extreme marathon to cycle, Delco started his official training for Tour d’Europe 2007 in August, 2006. His training included indoor and outdoor cycling, as well as strict diet. During these training periods, Delco cycled one-day marathons around Italy (315 km) and around Hungary (320 km). On couple occasions, he cycled the distance from his home in Tafers to Lake Geneva in Switzerland (300 km). He also cycled a marathon on the Alps – Tour d’Alps 2006 – where he passed 1,397 kilometers in only 8 days, on a total altitude of 26,360 meters. After almost a year of hard training, the marathon started on May 17th. Delco took off from his house in Tafers, Switzerland, and as the days were passing, Delco was going through Austria, Slovenia, Croatia, Serbia, ultimately passing through his home country - Macedonia. There, at the border and afterwards in the nearby city of Kumanovo, he was welcomed by a large group of people and a special event was organized in his honor. The event consisted of music, dancing, and speeches of encouragement by the President of the Macedonian Cycling Federation and the Mayor of the second largest city in Macedonia. All of this had a single purpose of praising Delco's gesture and supporting him on the way to a successful finish of his marathon. Passing through Macedonia, Delco cycled Greece and after crossing the sea, he cycled the entire cost of Italy. Upon entering into France, near Marseille unfortunate event happened – Delco and his team, while sleeping in the RV were robbed by unknown group of criminals. Most of the money they were carrying was taken, digital cameras and cell phones also. After this, Delco was under a lot of stress and thinking – should the marathon continue or should it be stopped due to this unfortunate event and lack of money? Delco Angelov, cycling average of 272 km per day, cycled the rest of his route, even passed entire Norway and cycle through the Arctic Polar Circle where it was very hard to establish when to sleep and when to cycle due to the 24 hour daylight that is present there.